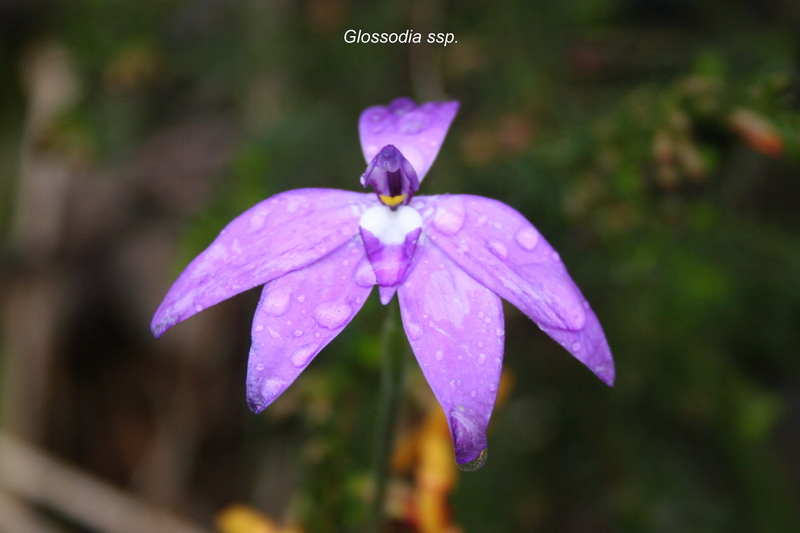 The Weed Orchid from South Africa, Disa bracteata, was recently spotted in Spring Valley Road, Flowerdale. Only one individual plant was found and has since been destroyed. This species has great survival skills and can soon colonise an area. It doesn’t rely on specific pollinators or soil fungi as many of our indigenous orchids do, to set seed and germinate. 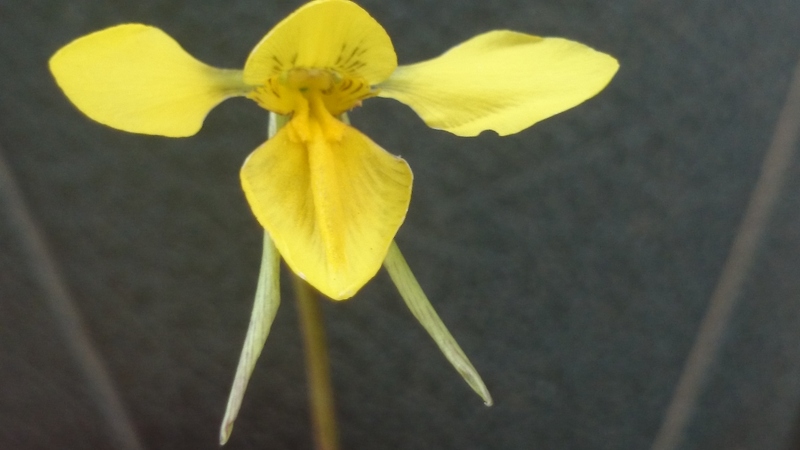 The seed from which this individual originated may have been brought into our area with machinery that has been slashing the roadsides over the last couple of years.Report any sightings of the South African Weed Orchid to your local NRM organisation or Landcare Group. The traditional four seasons don’t really figure when you live in an area such as Flowerdale. With an early summer coming on and the grass curing very quickly, we’ve had a very short orchid season. These beautiful gems of our roadsides and un-grazed open bushland have all but finished for the year. One of my favourite roadside sites that contains tiger orchids, nodding greenhoods, onion orchids and small sun orchids is on an embankment in an area that was given some attention by the Shire this year. Last month for the first time in many years the roadsides were slashed here which would be welcomed by some who worry about potential fire fuel load with hot dry days upon us. For others, it was disappointing to see many small shrubs and herbaceous plants such as Narrow- leaf Bitter Pea and Austral Indigo reduced to mulch. A conversation with the Shire worker suggested that putting up signage or other indicators of significant areas known to locals would greatly assist their approach. 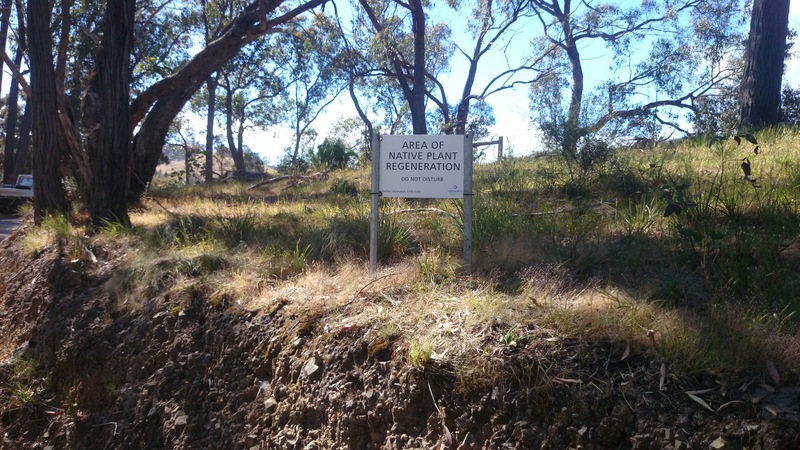 With that in mind our group contacted our Upper Goulburn Landcare Co-ordinator Chris Cobern, who assisted me in putting in place a sign that may help protect an area of diverse ground flora and encourage other locals to look more closely at what they may have on their roadsides. In 2013 I counted 120 Tiger orchid individuals on this site, this year I counted 118. 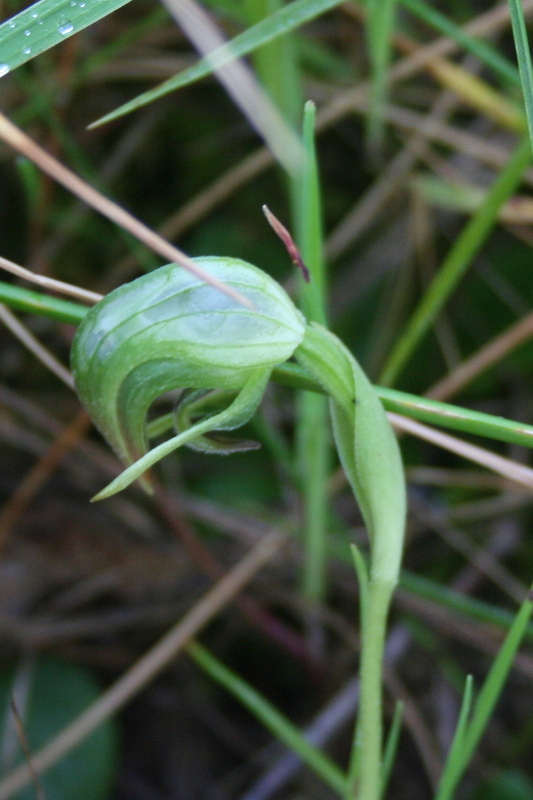 I also noticed the Tiger orchid in a number of other sites around Flowerdale. 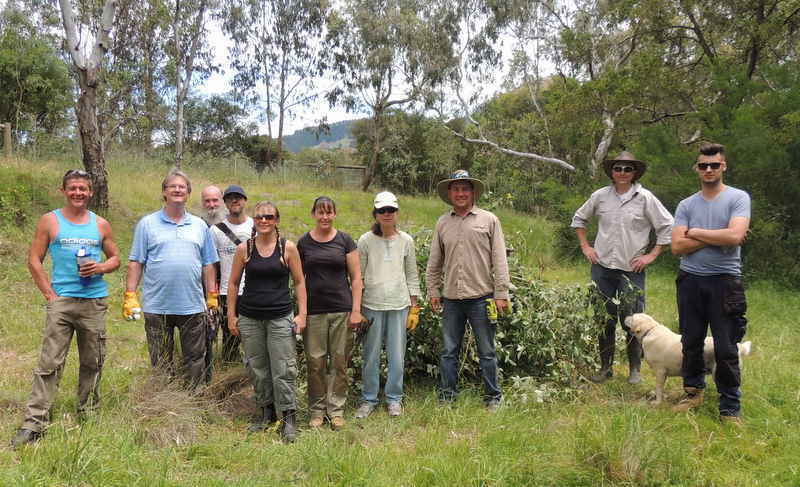 Recently I have been fortunate to work with volunteers alongside Chris Cobern on fence building in the Mickleham/Kilmore fire affected areas (Feb. 2014) of Willowmavin/Kilmore assisting landholders in the South West Goulburn Landcare Network area. 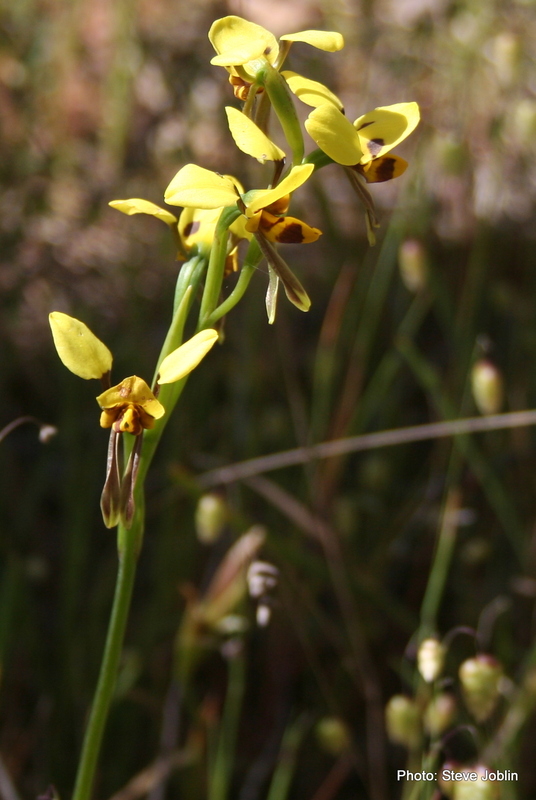 As with Flowerdale after the 2009 fires, I have noticed prolific flowering of orchids, in particular Golden Moths (Diuris chryseopsis) along the roadsides in the fire affected areas of the Mitchell Shire. On a recent walk through the bush at Dixons Creek I photographed a beautiful orchid commonly called the Wax lip Orchid (Glossodia major). Definitely a gem. 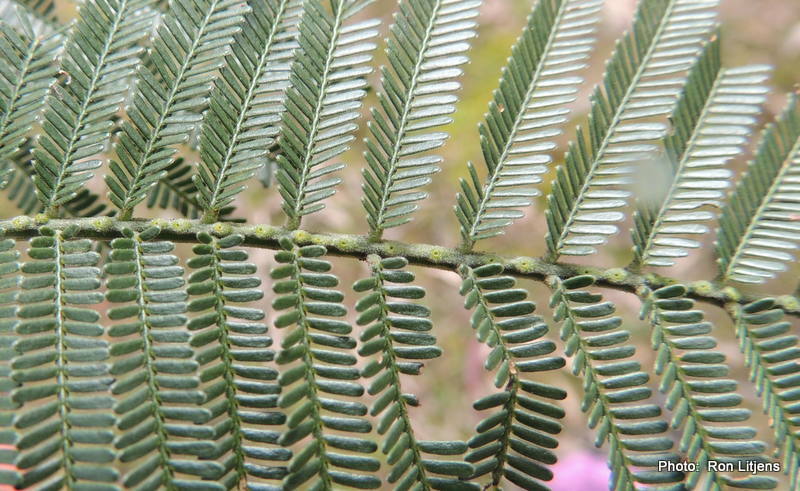 One of the key ways to identifying a wattle (acacia) is the form of the leaf. Some species have bipinnate (feathery) foliage (pictured left). 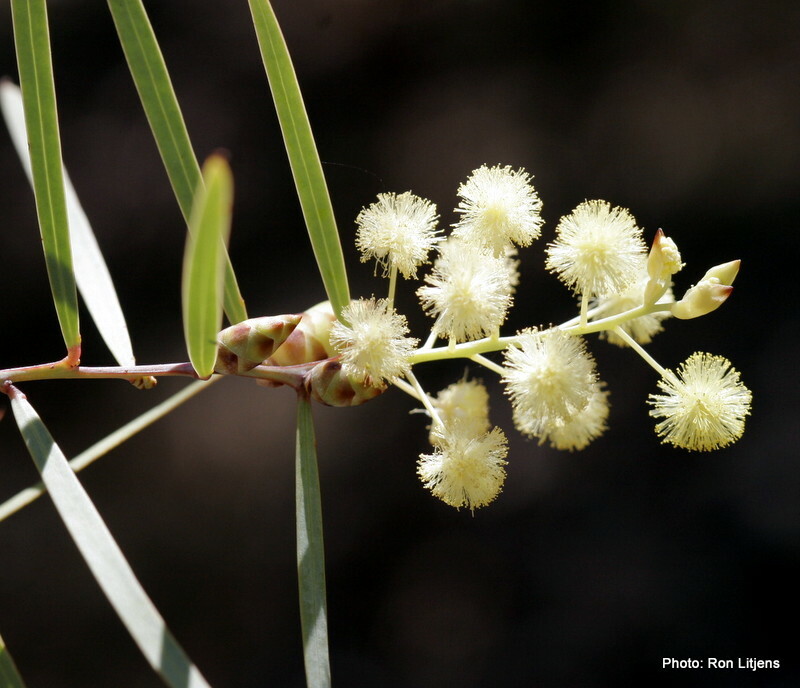 These include Black Wattles (Acacia mearnsii), Silver Wattles (A. dealbata) and in our district, the environmental weed the Cootamundra Wattle (A. baileyana). 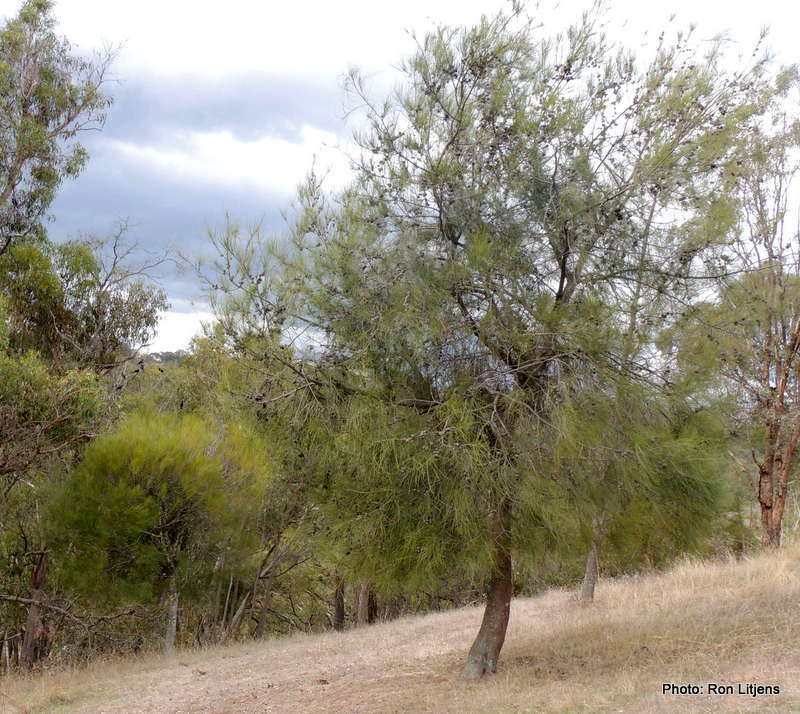 Other wattles such as Blackwoods (A. melanoxylon) and Lightwoods (A. implexa) have, instead of bipinnate foliage, leaf-like structures called phyllodes (pictured right). The development of phyllodes is a response to the harsh Australian conditions. Phyllodes can be oriented with their edges to the sun to reduce the amount of light hitting the leaf surface and hence reduce sun damage and loss of moisture. I recently came across this young wattle (pictured left). It was obviously an acacia but it had both bipinnate foliage and phyllodes. It looked as if it couldn’t quite decide want it wanted to be when it grew up. Bipinnate foliage is the true form of wattle leaves. 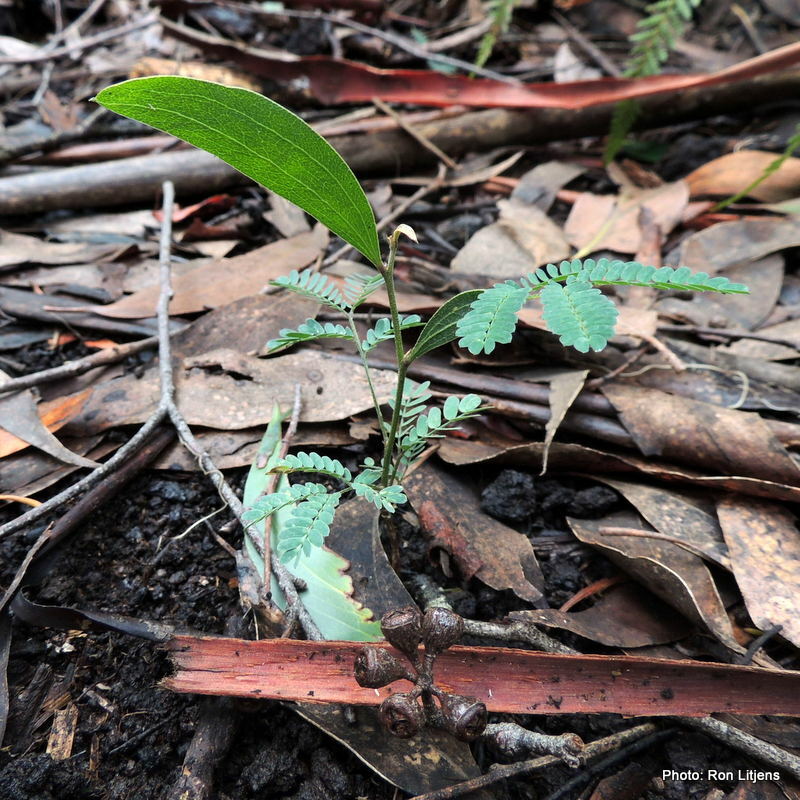 All wattles start life with bipinnate leaves. In some wattles these quickly transition into phyllodes. For species such as the Blackwood, bipinnate leaves can last until the plant is considerably developed. Such plants can exhibit both types of leaves simultaneously. The acacia in the photo turns out to be a Blackwood, not a confused young plant, but a late transitioner. I can relate to that. Q: What do you say when you meet a She-oak? She-oaks (Allocasuarina sp.) are unique to Australia and the South Pacific. The common name, She-oak, was derived in colonial times when it was recognised that the wood produced an inferior oak-like grain. The scientific name Allocasuarina comes from the word allo meaning like, or similar to, and the Latin word casuarius for cassowary, because the branchlets resemble the quills of a cassowary. These trees are also called Australian Pines because they superficially look like Pine-trees (Pinus sp.). 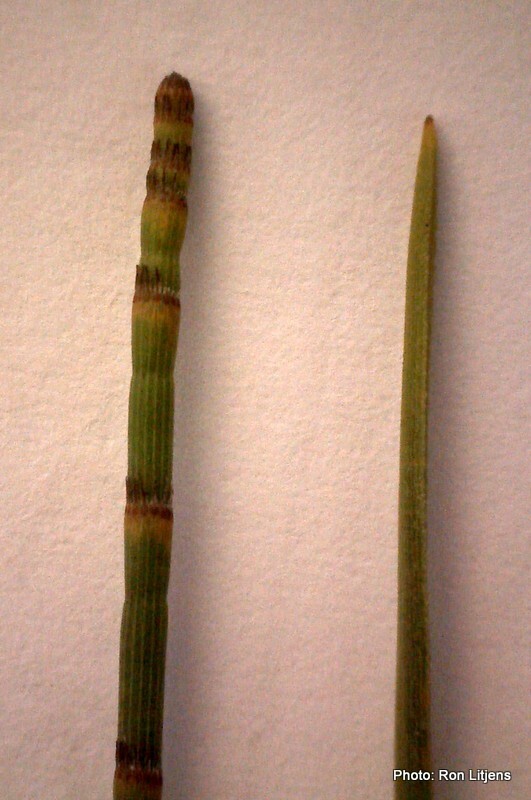 The photograph (left) shows the clear difference between a pine needle (right) and a she-oak branchlet (left). The she-oak branchlet is segmented and ribbed. Each segment ends with a whorl of teeth-like structures that can be more clearly seen if the segments are twisted apart (pictured right). It is these structures that are the actual leaves of the she-oak. The number of leaf–teeth in the whorl and the length of each segment are diagnostic for determining the she-oak species. 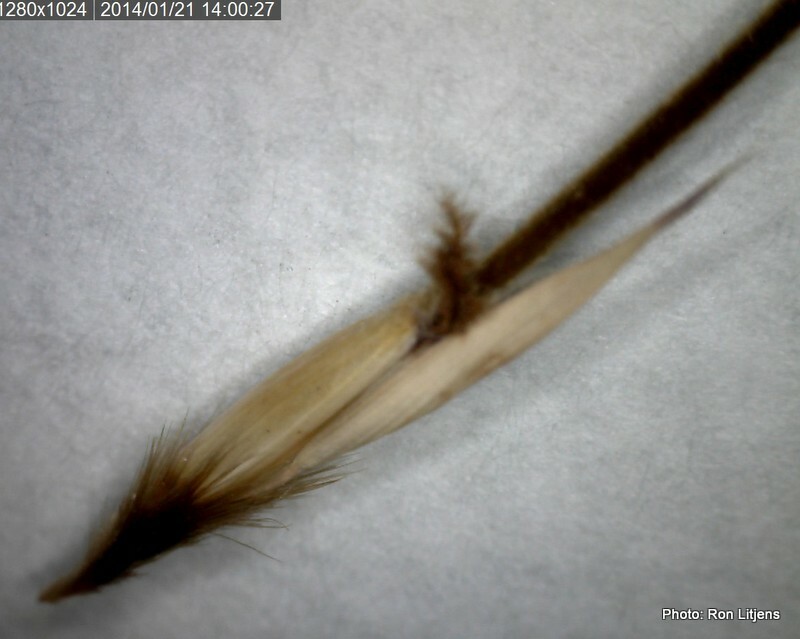 Common in our valley, the Drooping She-oak (Allocasuarina verticillata) has 9–12 leaf–teeth per whorl and the Black She-oak (Allocasuarina littoralis) has 6–8 leaf-teeth per whorl. The trees are either male or female and at our place there are several examples of a female (cone-bearing tree) standing next to a male tree (sometimes called He-oaks), (pictured left). In today’s politically correct world it is only a matter of time before they are called Person-oaks. One can be forgiven for thinking the US Masters Golf tournament had suddenly changed continents. It only takes a little bit of rain to ‘kick-start’ the annual fungi cycle. 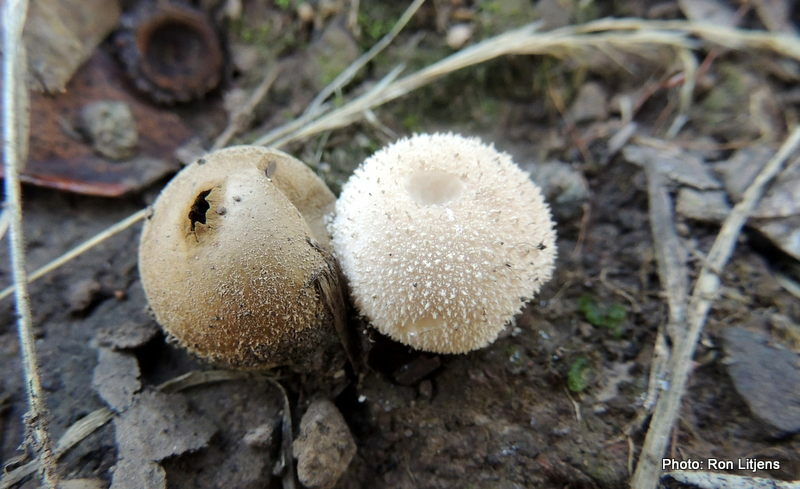 And after the rains last week one of the first fungi to pop out of the ground around Flowerdale is the Common Puffball (Lycoperdon perlatum) (see picture below). Perlatum is Latin for widespread, and widespread they are. It looks like someone has been enjoying golf practice out in the bush. The puffball, which is covered in tiny spikes and warts, is the fruit of a much larger fungus that lives below the soil. The ball is analogous to an apple on an apple tree. The fungus could cover an area of tens if not hundreds of square metres as a network of underground mycelia or filaments, from which the fruit—the puffballs—emerge at the surface. When young, the puffball is white inside but turns brown as millions of spores (analogous to seeds) develop. As the fruit matures the external surface also turns brown and a hole develops in it. The puffball pictured on the right shows the hole beginning to form at the top. The mature puffball on the left shows the developed hole. It is through this hole the spores are released. The slightest pressure on the surface of the puffball is enough to eject the spores. A single rain drop or water droplet from a tree hitting the puffball can cause millions of spores to be ejected in a single burst. Just imagine how many spores you could release if you hit the puffball with a golf driver! ‘Where have all the flowers gone?’ you may be asking yourself. Six weeks ago the landscape was covered in blooms—especially grass inflorescences—but now only a few plants are bearing flowers. All that time for pollination and fertilisation has past. The catch cry out there at the moment is ‘Go forth and multiply’. Dispersing the seed is what it is all about. Plants have a developed several methods for doing this. One way is to ensure that the seed attaches itself to the feathers, fur and socks of birds, animals and humans that pass by. To do this the seeds have developed an amazing array of hooks, barbs and spikes. 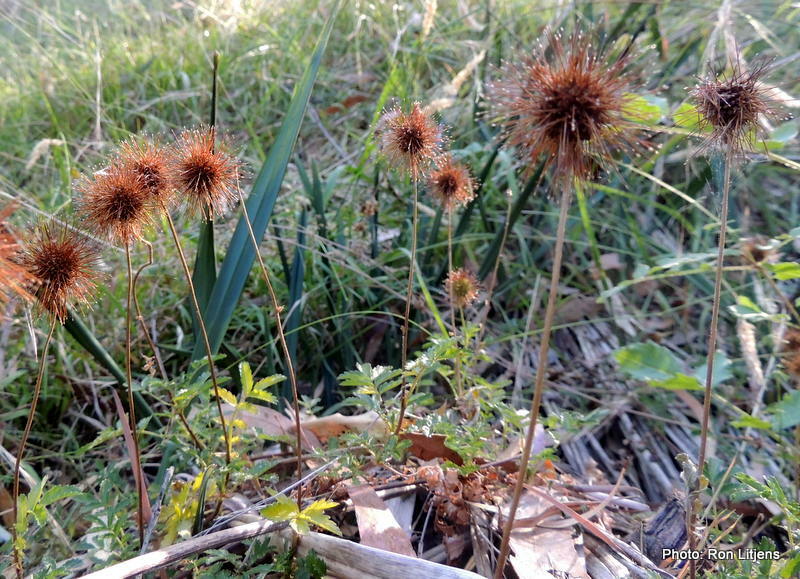 Bidgee-widgee (Acaena novae-zelandiae), pictured above, is a native herbaceous creeper found in our district. 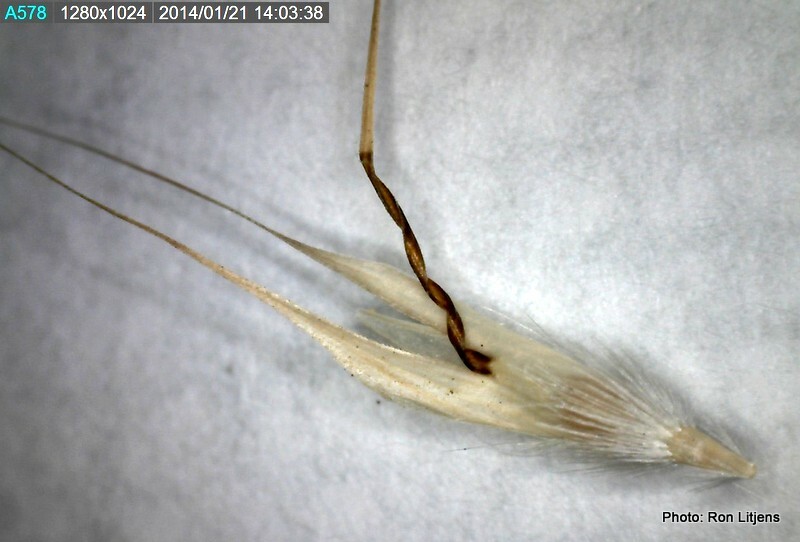 To give the seed the best chance of catching a lift, the seed heads are elevated on stalks. 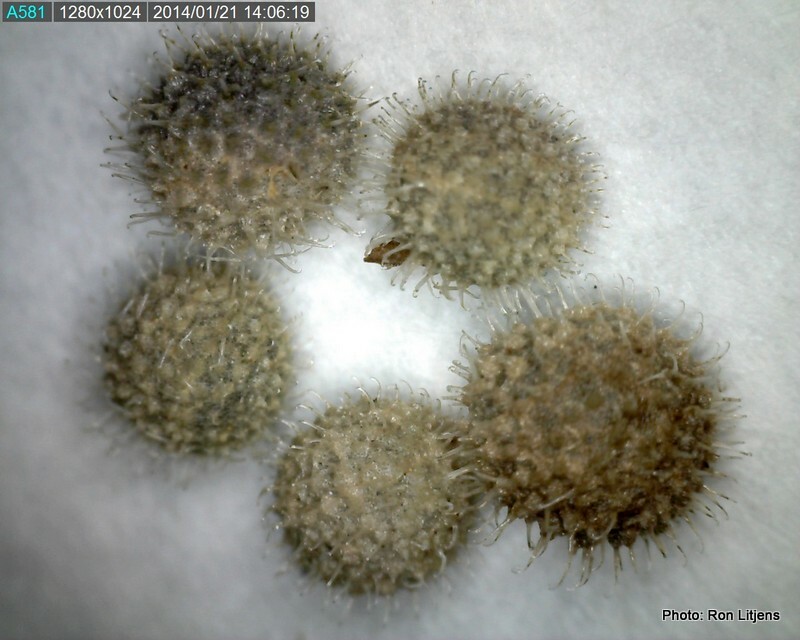 When they are touched by a passing traveller the seed balls disintegrate into separate barbed seeds (pictured above). 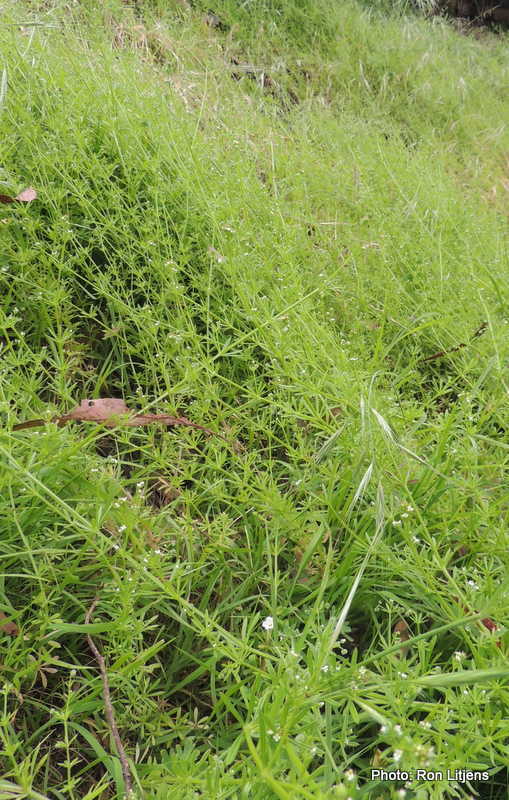 The weed Cleavers (Galium aparine) has recently featured in a post (click HERE to view). Its spherical seeds are covered in an array of tiny hooks (pictured left). Similarly the native Wallaby Grass (Austrodanthonia spp.) seeds, right, and Kangaroo Grass (Themeda triandra) seeds, below, also have their ways of attaching themselves to passers-by. Next time you are out walking in the grass check your socks for these hitch-hikers. When I was younger I used to hitch-hike as well. Copying Mother Nature, instead of using my thumb maybe what I needed was a Velcro suit! Last Tuesday Chris Cobern, Landcare Coordinator for the Upper Goulburn Landcare Network, led a group of TAFE students completing a Certificate in Conservation and Land Management to undertake weed control at the Flowerdale Recreation Reserve. 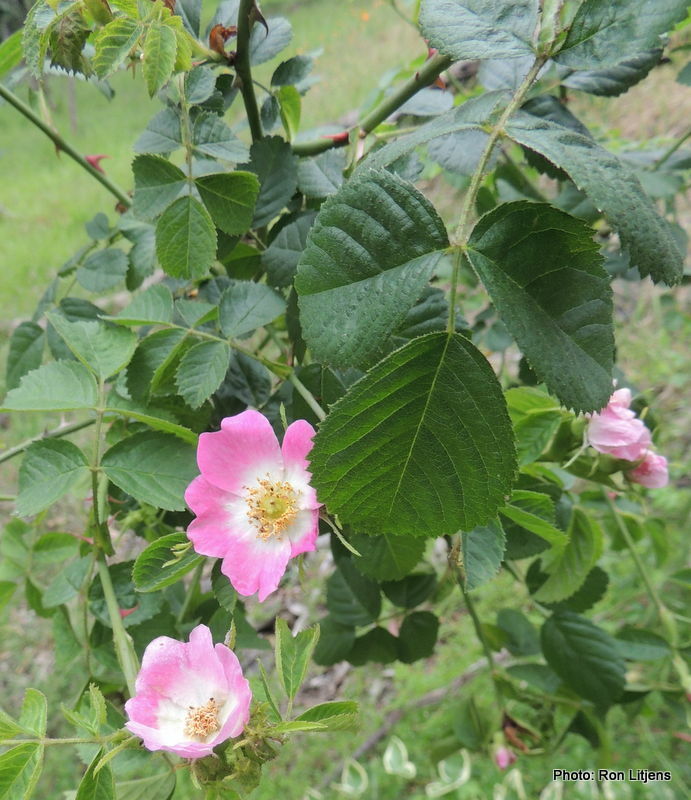 On the agenda—removal of woody weeds, in particular Sweet Briar or Briar Rose (Rosaceae rubiginosa), a particularly prickly weed (pictured left) and Blackberry (Rubus fructicosus), probably our worst prickly weed (pictured right). Participants were shown the cut-and-paint method of removing these weeds. The task was made more difficult by the Native Raspberry (Rubus parvifolius). This is a native prickly plant and it was intertwined among the blackberry. Similar to a problem outlined in a previous post (click HERE to view), the difference between the two plants is easy to see if the plants are separated, but intertwined together the task of removing only the blackberry becomes fiendishly difficult. 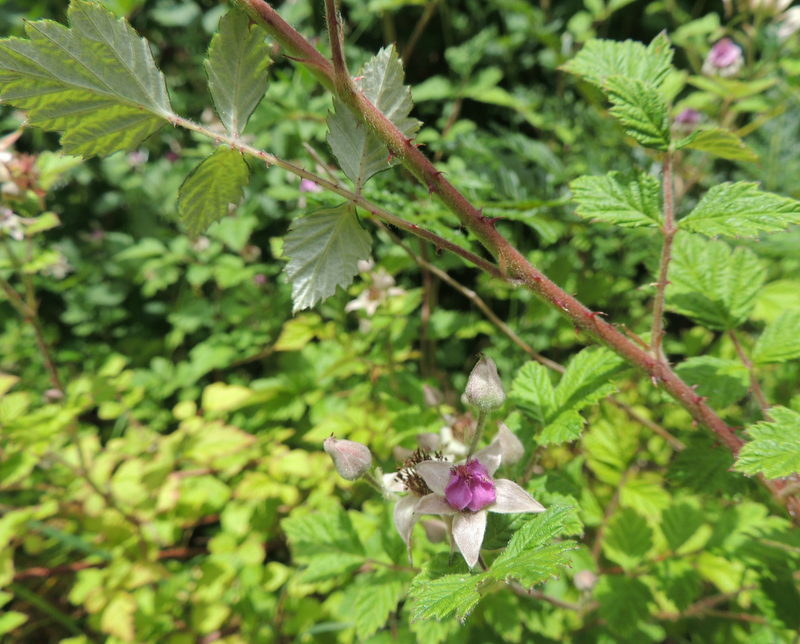 Native Raspberry (pictured left) is a rambling shrub with light green, toothed leaves and pink flowers. The leaf colour, flower colour and pale under-leaf distinguish it from the Blackberry. 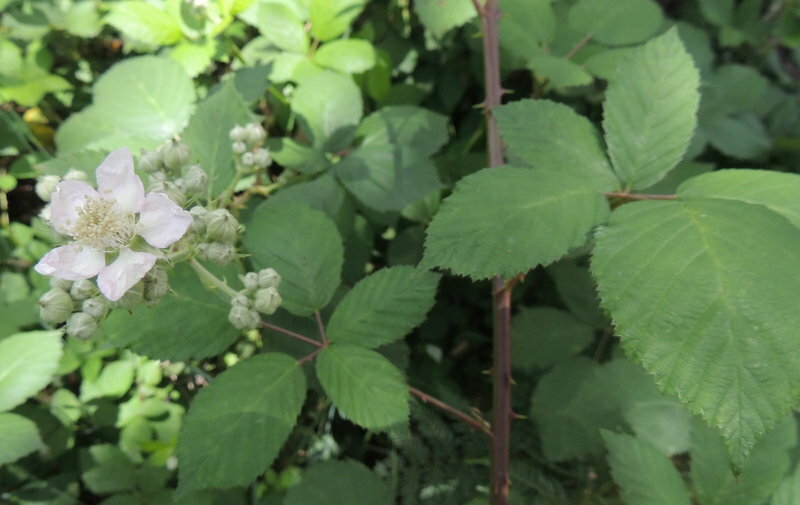 The Blackberry has a darker green leaf and white flowers. The students made a great start clearing the prickly invaders from the area. In addition, they removed some Prunus species from the creek bank and Chris demonstrated the ‘drill-and-fill’ method for killing weeds on a Willow tree. 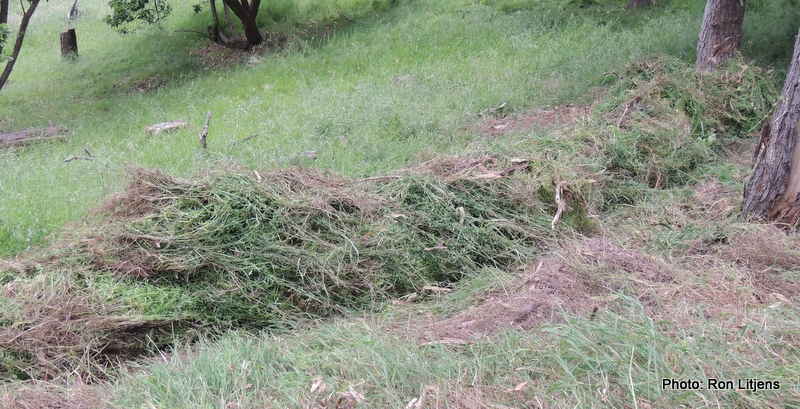 After a successful morning of work, there was a markedly less-weedy stretch of land along Spring Creek, a pile of weeds (see below) and huge appetites. Thanks to all who participated. You are welcome back anytime. Cleavers (Galium aparine), or Sticky Grass as we used to call it as kids, is a weed native to Europe and central Asia that is distributed all across Australia. 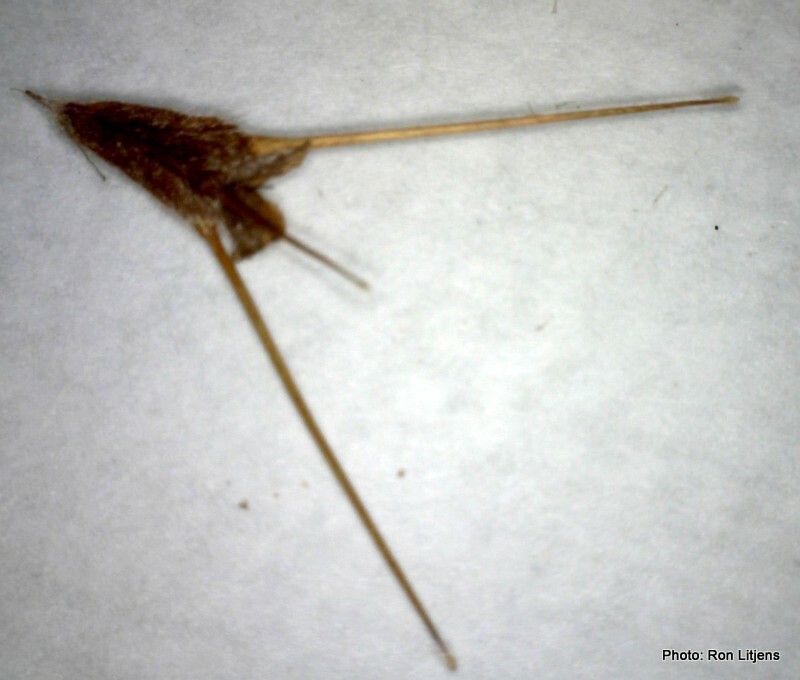 The ‘stickiness’ is due to small hooked hairs that grow out of the stem and leaves. This year has been a bumper year for Cleavers. The stems, which can extend over a metre in length, have covered parts of our property in a web of green, climbing up trees and choking the undergrowth (pictured left). Each year we try to remove it because it smothers other vegetation. But this year especially we do not want the fire fuel load from Cleavers as it dries out. November 20 was a cool, slightly overcast day. The Cleavers was starting to flower. It could only mean one thing – Cleavers Rollup Day. For those of you with large acreage or who use chemicals as a way of removing stubborn weeds DO NOT read on. I would not want to be responsible for your hernia from excessive laughter. My method for cleaning it up, never before reported (not by me anyway) is to start at the top of the hill and roll up the long stems. The sticky stems attach themselves to one another and as you roll it down the slope it ‘self-pulls-up’ its own roots. The added advantage is that this method (Patent Pending) picks up most of the loosely rooted weeds like Quaking Grass (Briza spp.) while leaving the native groundcovers like Bidgee-Widge (Acaena nova-zelandiae). At the bottom of the slope I am left with a roll of Cleavers about one metre high and 15 metres long (see picture right). Wikipedia tells me the leaf and stems can be cooked as a leaf vegetable. Maybe I have just invented the world’s largest vegetarian version of the Chiko Roll. And as for my personal goal of pulling out 250 weeds a day, I am about four and a half years ahead of aim! Last week I was invited to participate in a weeding session at the Murchison Spur lookout. The Strath Creek Landcare Group had previously planted the area with native flora and in preparation for the upcoming weeding/clean up event on November 30 (hint, hint for those who have a couple of hours free) it was decided to prepare a model (weeded) area to highlight to the many eager weeders who undoubtedly will turn up, what is a native plant and what isn’t. Sometimes it’s difficult to tell. How hard could it be? Well very hard actually. Forgetting about the occasional rain shower and the gale force winds I was assigned an area consisting primarily of ground creepers (pictured left). 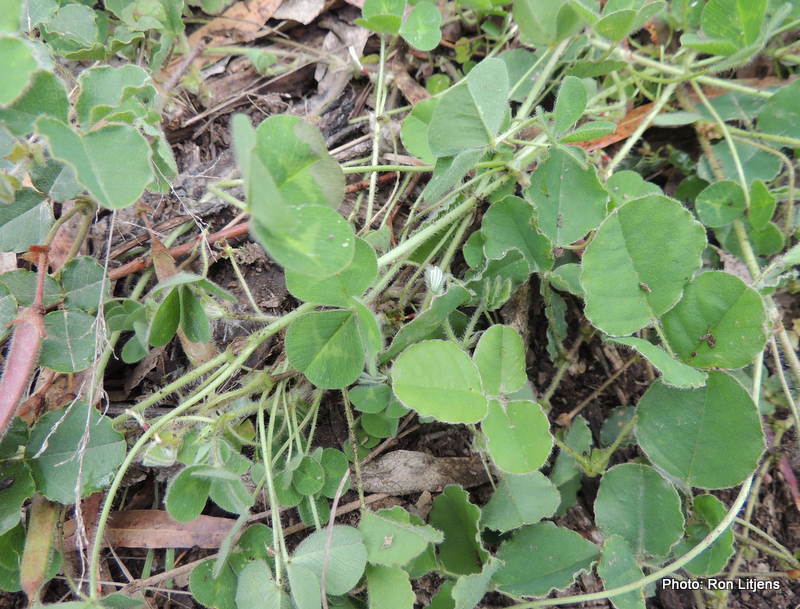 Intertwined on the ground were Running Postman (Kennedia prostrata) and Subterranean Clover (Trifolium subterraneum). Separated, it is easy to distinguish between them. 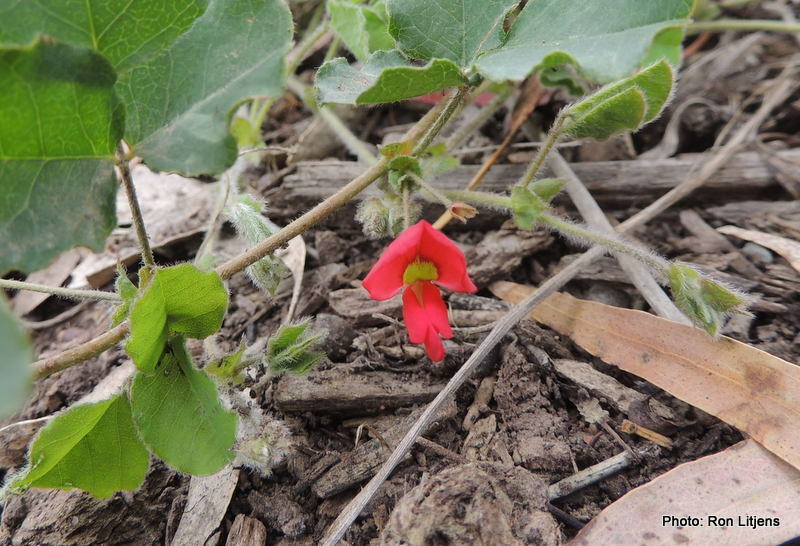 The former has red pea-shaped flowers (pictured right) and the latter white flowers. But mixed together they formed a puzzle more complex than the most devious Sudoku. 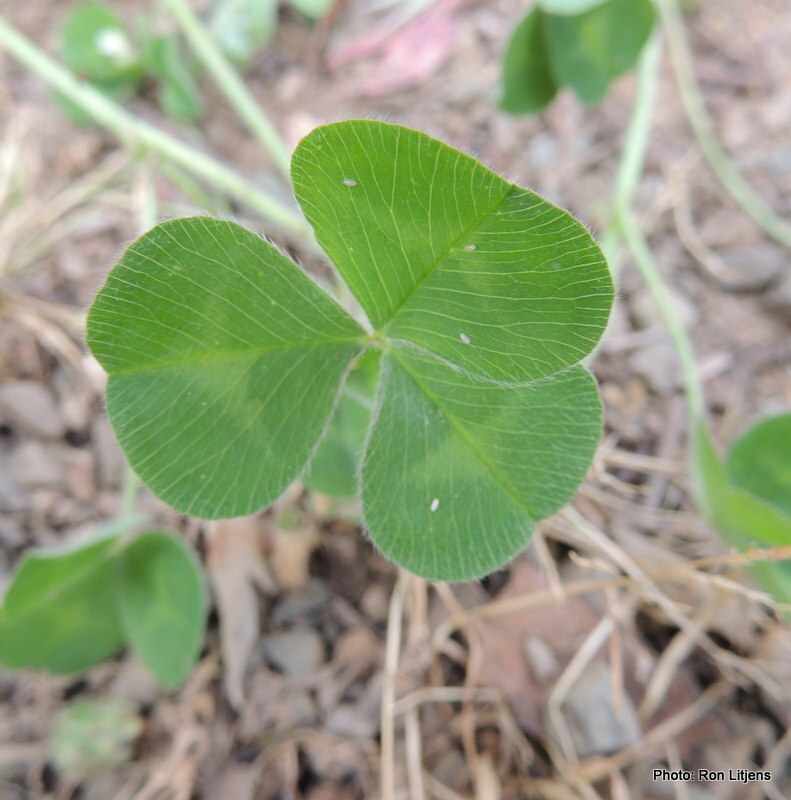 The trick is that the leaves of each have a slightly different shape and the clover leaf has a light pattern on it (see left). It took hours to carefully separate the two and remove the clover. So if the cryptic crosswords are getting too easy and the sudokus a breeze, November 30, 10am, Murchison Spur Lookout. If you really want a challenge. I admire people who can walk through the bush and identify the flora without referring to a field guide. To do this I think you need a good knowledge of what flora should be in the area (that will whittle down the hundreds of choices down to the tens), and then a system for classifying them. For nearly a decade I have been trying to learn all the plants on our property (with little success). I’ve started with the acacias. 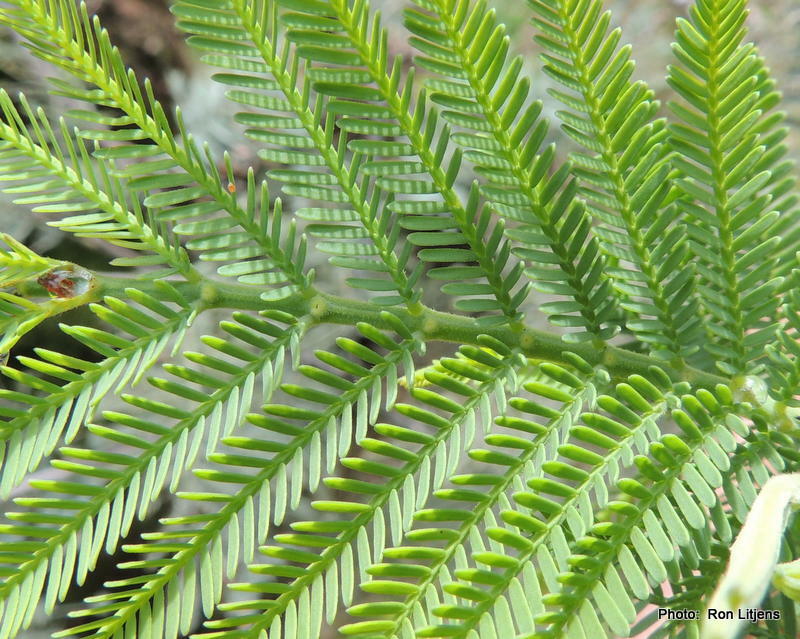 Acacias are divided into six groups based on the shape and form of the leaves and flowers. Using the colour of the flowers is not very helpful! 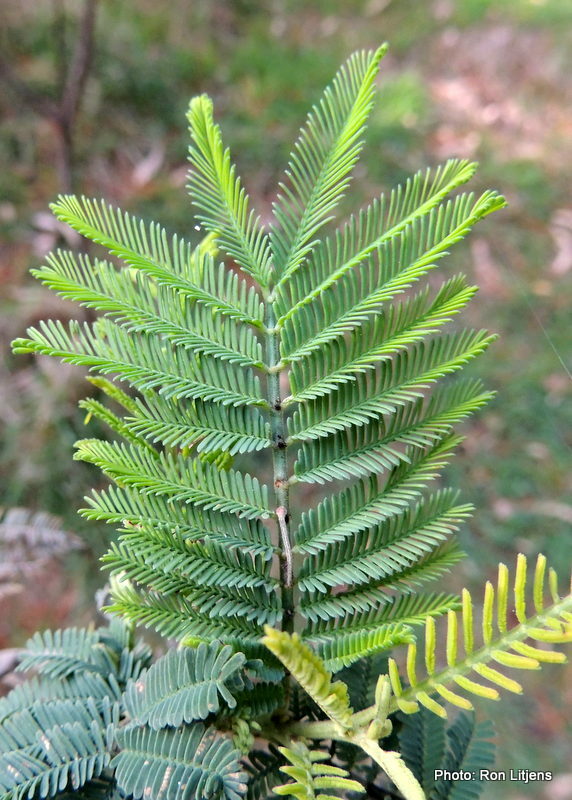 Group 1 acacias contain wattles with bipinnate foliage (as opposed to single leafed). I call them feathery-leaved wattles. Where I live there are only three species with this type of leaf – the Cootamundra Wattle (Acacia baileyiana) (an environmental weed in this area, planted by the previous owner), the Silver Wattle (Acacia dealbata) and the Black Wattle (Acacia mearnsii). The Cootamundra is easy to pick – SMALL bipinnate leaves and that unique light blue-green colour. The Silver and the Black Wattles are a bit trickier to tell apart. 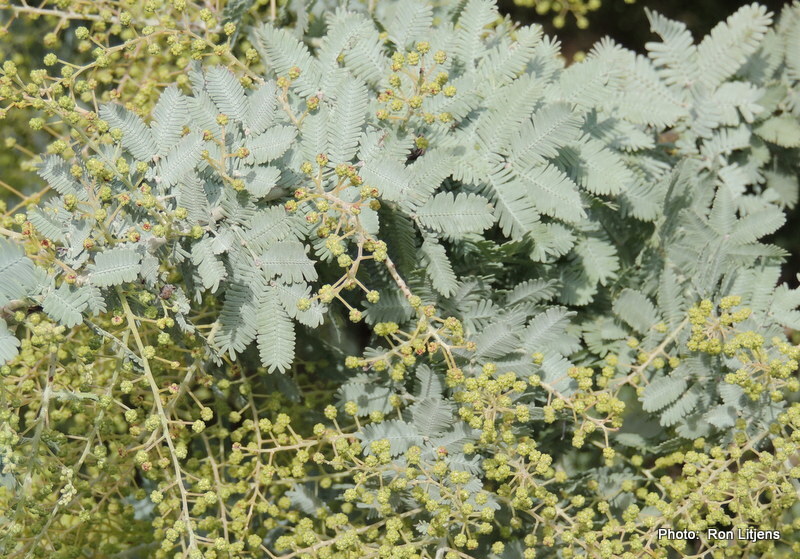 The Silver Wattle flowers a bit earlier but how do you pick them when they are both in flower or both not? I’m glad you asked. You will have to look closely at the rhachis – the stem down the centre of the leaf. Distributed along the rhachis are tiny oil glands. In the Silver Wattle the oil glands are situated AT the point where each pair of pinnates is attached to the stem (pictured above). 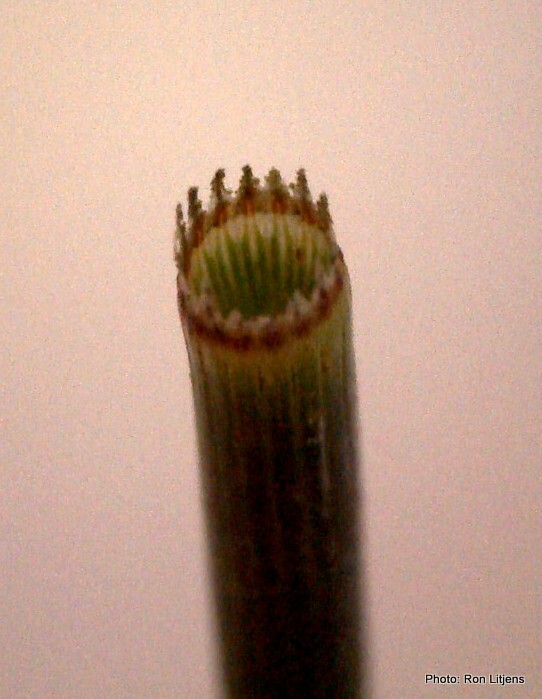 In the Black Wattle, those oil glands are BETWEEN the spot where the individual fronds meet the stem (pictured below, click photo to enlarge). Tricky, eh? Well, that covers the bipinnate wattles. That only leaves 11 more acacia species and several dozen more trees to come to grips with.